TORONTO, ON – November 21, 2018 – When life presents an open road, take it and immerse yourself in pure driving pleasure with the 2019 Lexus IS Series luxury sedans. For 2019, the IS Series available in a choice of drive trains and trim levels, including the performance-driven F SPORT. The IS 300 RWD features a 2.0L twin-scroll turbocharged four-cylinder engine that puts 241 HP and 258 lb-ft of torque at the driver’s command, while steering wheel-mounted paddle shifters put an eight-speed direct shift automatic at one’s fingertips. The IS 300 AWD and IS 350 AWD add an extra dose of exhilaration with a 3.5L naturally-aspirated V6 that generates 260 HP on the IS 300 and 311 HP on the IS 350. This is connected to a 6-speed Super ECT automatic transmission with paddle shifters and linked to the IS’s advanced all-wheel-drive system. Depending on the situation, this AWD system automatically allocates engine power between the front and rear axles to help the driver maintain superior traction without ever sacrificing drivability. All models feature the Lexus Drive Mode Select system, which lets drivers tune the IS to suit their mood and the road conditions, with the simple turn of a dial. The Eco setting increases fuel efficiency, while the Sport setting boosts exhilaration. F SPORT models assert a more aggressive presence and express the driver’s passion for performance. These models enhance the Drive Mode Select system with Sport S/S+ modes, which sharpen gear changes and reduce the body roll to boost adrenaline during spirited driving. Those equipped with adaptive variable suspension systems adjust the damping force of shock absorbers in response to driver input and road conditions. Curbside, all 2019 IS models express their athletic prowess from every angle. The bold spindle grille is flanked by air intakes that clearly announce the IS’ performance-focused intent. Auto-levelling LED headlamps fuse effortlessly into a character line that runs the length of the silhouette, imparting the impression of a vehicle in motion – even when standing still. Exterior details of note include LED headlamps and daytime running lights, heated exterior mirrors with integrated signal lamps, and alloy wheels. On F SPORT models, their added performance is matched with more aggressive exterior styling – including a distinct F SPORT mesh front grille, larger cooling ducts to help reduce brake fade, and exclusive alloy wheels. Inside, the IS features a cabin that‘s thoughtfully designed to engage all the senses and enhance the driver’s command and control. The gauge cluster reinforces the sense that the driver is seated in a true cockpit, while generous interior dimensions and uniquely shaped seat backs offer rear seat passengers plenty of room to relax, complete with amenities, like an optional rear sun shade. Rear seats also split 60/40 and fold, to provide the flexibility to carry more cargo when needed. A long list of amenities includes a display audio system with USB audio input, Bluetooth® connectivity, SIRI Eyes-Free and steering wheel-mounted controls, dual-zone automatic climate control, power adjustable front seats, a multi-information display, power windows with auto up/down for all windows, leather-wrapped steering wheel, metallic shift knob and dash accents, stainless steel scuff plates, map lamps, analogue clock with LED illumination, integrated garage door opener, the Lexus Smart Key System with Push Button Start, 12V accessory power outlets, keyless entry with trunk release, rain-sensing wipers, and more. On F SPORT models, race-inspired interior touches include a three-spoke F SPORT steering wheel, drilled aluminum pedals, and sport seats designed to firmly hold the driver during high-G maneuvers – plus an instrument cluster derived from the Lexus LFA Super Car. As a Lexus, the 2019 IS series also offers drivers and passengers peace of mind through a comprehensive safety package – starting with Lexus Safety System +. This bundle of active safety technologies (pre-collision system with pedestrian detection, lane departure alert with lane keep assist, dynamic radar cruise control, and an automatic high beam system) is now standard equipment on 98% of all new models Lexus offers in Canada. LSS+ supports the driver’s awareness and decision-making under a variety of traffic conditions and contingencies. Other standard safety features include a backup camera, 10 airbags, a direct tire pressure monitoring system, anti-theft system and more. There’s even an onboard first-aid kit. The 2019 Lexus IS 300 RWD (starting MSRP: $41,050) features a 241 HP powertrain built around the powerful yet efficient 2.0L four-cylinder turbocharged engine, eight-speed sport direct shift automatic transmission with sequential multi-mode shifter, and authentic sport sedan rear-wheel-drive. This model features a 10-speaker Lexus Premium Audio system with 7” display, heated front sport seats, and 17” alloy wheels. This model may also be ordered as the 2019 Lexus IS 300 RWD F SPORT Series 1 (starting MSRP: $44,850). In addition to features already mentioned, this model includes the Active Noise Control System, blind spot monitor with rear cross traffic alert safety systems, heated and ventilated front seats, a power moon roof and electro-chromatic exterior mirrors. It’s then finished in a more aggressive style using F SPORT exclusive details including 18” alloy wheels, front grille, aerodynamics package, front sport seats, steering wheel and shift knob. 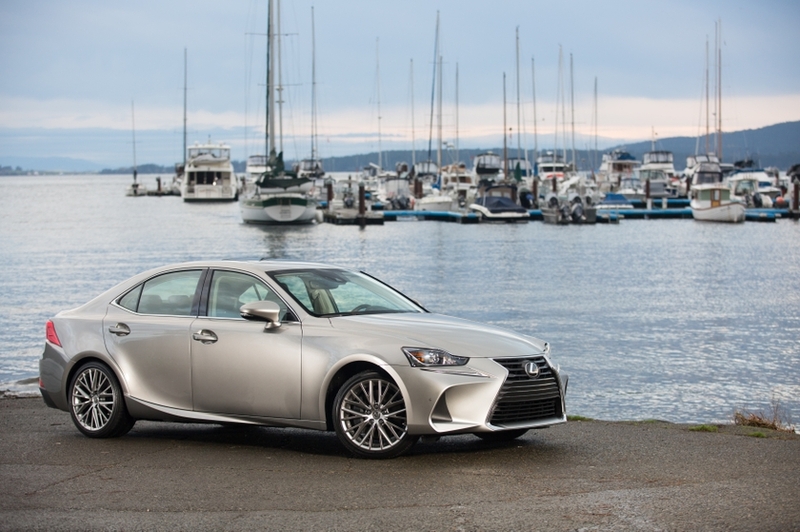 The 2019 Lexus IS 300 AWD Premium Package (starting MSRP: $45,500) adds a heated steering wheel, 18” alloy wheels, heated and ventilated front seats, and a power moon roof and also now boasts blind spot monitoring and Rear Cross Traffic Alert for additional safety. The 2019 Lexus IS 300 AWD Luxury Package (starting MSRP: $48,450) builds on this, adding a navigation system with 10.3” display and Lexus Remote Touch interface, the blind spot monitor and rear cross traffic alert safety systems, a driver’s seat memory system linked to the steering column and auto-dimming exterior mirrors, clearance and back-up sensors, an auto-dimming rear view mirror with home link system and the Lexus adaptive front lighting system. The 2019 Lexus IS 300 AWD F SPORT Series 1 (starting MSRP: $47,400) enhances the basic model with blind spot monitoring and Rear Cross Traffic Alert safety systems, heated and ventilated front seats and a power moon roof. It’s then finished in a more aggressive style using F SPORT exclusive details including 18” alloy wheels, front grille, aerodynamics package, front sport seats, scuff plates, steering wheel and shift knob. The 2019 Lexus IS 300 AWD F SPORT Series 2 (starting MSRP: $50,200) builds on this, adding a navigation system with 10.3” display and Lexus Remote Touch interface, the blind spot monitor and rear cross traffic alert safety systems, heated and ventilated front seats, a driver’s seat memory system linked to the steering column and exterior mirrors, heated steering wheel, clearance and back-up sensors, and heated and auto-dimming electro-chromatic exterior mirrors. The 2019 Lexus IS 350 AWD F SPORT Series 3 (starting MSRP: $56,000) builds on this, adding a 15-speaker Mark Levinson Surround Sound audio system, a power rear window sunshade and triple LED headlamps.